Offering you a complete choice of products which include un bags. 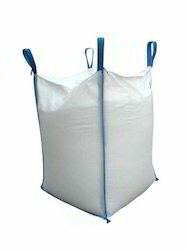 This is a special line of bulk UN Bags dedicated to the transportation of dangerous materials. Un bulk bags are made in accordance with the United Nations recommendations on the transportation of dangerous materials, more commonly known as the orange book for road (ADR), railway (RID) and marine transportation (IMDG - Code). Our UN bags are large and designed for packaging category II and III materials defined in chapter 9 of the orange book typical product - poisons and corrosives. Looking for UN Bags ?